I Tried it out and i totally like it! Really good job on that. Just got one question. If i have set a small height for the card. Most of the height is taken by the margin of the Text while the graph could be a bit bigger (at least for me see picture ) I already tried a bit to change the css, but iam no expert. Could you give me a hint? The height option does only affect the line graphs height, as stated in the readme under the options section. Fixed <path> attribute d: Expected number errors. Important: You need to update both mini-graph-card.js and mini-graph-lib.js this update. Is it possible to template the line_color: to show a different colour depending on thresholds ie above 24 degrees line goes red etc? Certainly, that’s a great idea, I’ve now added options to achieve this, both for below & above specified values. (see readme on github). Yeah, that’s interesting. I did actually change the scaling to 0.95/1.05 in v0.0.3. This obviously doesn’t work well in all cases but for the majority I think this is a good middle ground for now. But some space is still wasted when the line doesn’t take up the available height of the svg element. The reason why I included the min/max scaling was to be able to tell approximately how big the change in the graph is. If you have any ideas on how to improve this further, let me know! Yeah, i see your points. Totally valid. I guess for most cases its good. Maybe allow the user to set a fixed Ymin & Ymax value? For room temperature it would be good (eg set 20-25) so its easy to see the increase/decrease. Yeah, for sure, I see use cases for some sort of Y-scale option. If you can think of a suitable solution and have time you are welcome to make a PR. That y-label is not bad start, nice one. how I can fix it, please? I tried to upload again the files and I changed the frontend last version on the configuration file. Please check the files again and make sure your local files match mini-graph-card.js and mini-graph-lib.js. 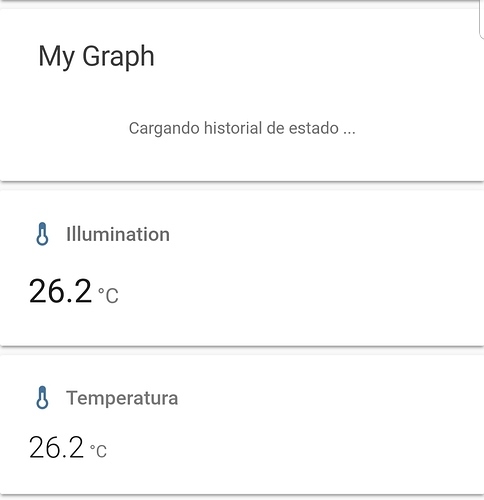 I can’t showing the line of graph. I used three methods but you do not see any. Just curious, what is the difference between this one and the builtin lovelace sensor card? I’m simply loking for what it brings more to decde if I try it. the last two are from lovelace. Looks like there is no history available for the sensor named sensor.temperature. Make sure you have history enabled and working. Great question. 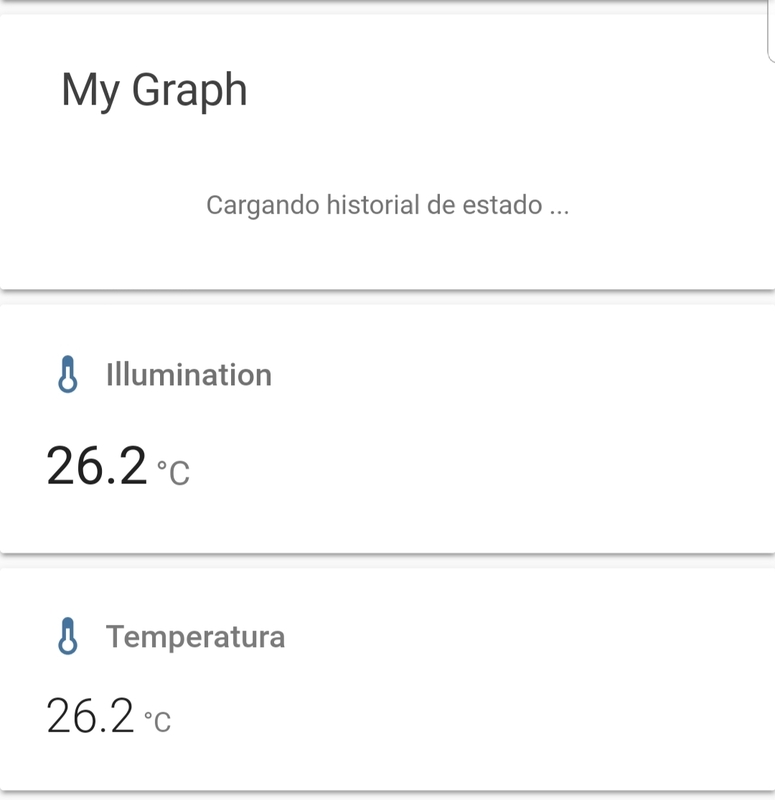 Not much actually, since first releasing this custom card I’ve contributed it to the HA core and it’s now available as the sensor card with Home Assistant 0.80.0 and later. Also, this card is more accessible to modify and customize compared to the official card imo, since you don’t have to rebuild the frontend. I would recommend using the official card if possible. Platform cast not ready yet. Retrying in 30 seconds. Setup of platform cast is taking over 10 seconds. Setup of platform yweather is taking over 10 seconds. Setup failed for logbook: Could not set up all dependencies. Template sensor iframe has no entity ids configured to track nor were we able to extract the entities to track from the value template(s). This entity will only be able to be updated manually. Setup failed for history: Could not set up all dependencies. Setup failed for recorder: Component failed to initialize. Setup of recorder is taking over 10 seconds.